Fans may have been waiting nearly ten years for The Hobbit to finally be adapted for the big screen, but this prequel to The Lord of the Rings is never late, nor is it early, it has arrived precisely when it meant to - well almost! The road for the filmmakers and the fans has been nearly as long as the one Bilbo Baggins is just about to embark upon himself, with changing directors and studio crises aplenty, but now that it's finally here the big question will be answered: was it all worth the wait? This one is going to be a bit trickier than most of my reviews, for as you'd probably expect it's difficult to review a film that you've only seen 1/3 of! Of course I did see the whole of The Hobbit: An Unexpected Journey - I didn't get annoyed and walk out an hour in or anything - but in the grand scheme of things this is just the first of three films that will make up the film adaptation of The Hobbit, and much like The Lord of the Rings Trilogy I expect that the whole will be greater than the sum of the parts. Unlike other great film trilogies, like Christopher Nolan's Dark Knight Trilogy for instance, the three films form the beginning, middle and end to Bruce Wayne's story, but each film is its own individual piece that can be watched without necessarily needing the others. Whereas in the case of The Hobbit or The Lord of the Rings the tree parts form just one continuous story, making it difficult to fully appreciate just one of the films as a standalone piece. So for those asking the popular question 'is it as good as The Lord of Rings?' - come back and ask me summer 2014! As for part one of The Hobbit, fans of Peter Jackson's LOTR trilogy should feel what I felt; a sense of coming home. Returning to the world of Middle-Earth is nothing short of a nostalgic pleasure, jumping back down the Hobbit hole into the shire brought back the warm sense of homeliness established over a decade ago - I was back where I wanted to be, I was back home. Peter Jackson continues his cinematic argument that New Zealand is the most beautiful place in the world, with stunning vistas of wide fields, streams, mountains, forests and the like bringing the adventure well and truly to life. It all seems so familiar, with thanks in part to Peter Jackson returning to the helm to give the a film stylistic consistency with LOTR (whilst I'd have been fascinated to have seen how Guillermo Del Toro would have handled The Hobbit when he was set to direct it, I am glad to see Jackson back for this reason), and also with the return of a number of key members of the original cast too. 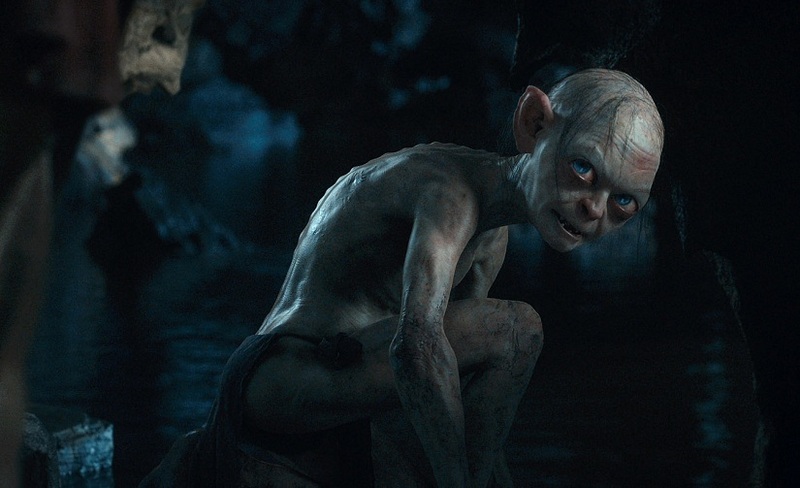 I shan't give away all of the returning characters for those who don't know, but as you'll probably already be aware Ian McKellen returns in fine form as the lovable wizard Gandalf the Grey, and Andy Serkis steals the entire film with his reprisal of the iconic character Gollum in the best sequence of the entire film. But let us not forget the newer members of the cast too, with Martin Freeman effortlessly bringing life to Bilbo Baggins, and the ensemble of Dwarves forming a similar pleasure to be around too. However, all is not well down in Middle-Earth. Whilst a Hobbit may be short, The Hobbit is not, in fact just like the epic trilogy that it is a precursor to, An Unexpected Journey is just short of a 3 hour running time. The film is very long, and at a number of points it does take it's time, which is good in some respects as it allows the us to fully explore the characters and plots of the film, but at times it is drawn out far too much to become unnecessary and a little tedious. This is where the maths doesn't quite add up: The Lord of the Rings is 3 books and 1077 pages long, where as The Hobbit is just 1 book and 255 pages long. So if there are 3 LOTR films each approximately 3 hours long, logically there should not be 3 Hobbit films at the same length if the tale is that much shorter. 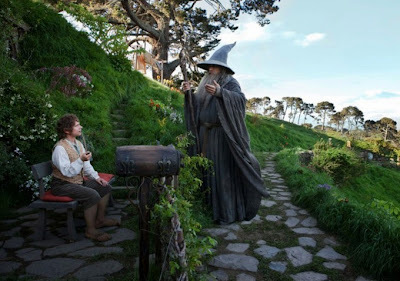 The Hobbit would benefit from a much shorter running time, as the film does not need as much time as the much bigger, more eventful Lord of the Rings Trilogy needs. They may be linked by certain characters, locations and events, but these are two very different stories. The Hobbit is a much more family based tale (with characters like Radagast the Brown and his cute woodland friends illustrating that point precisely), and the question needs to be asked: how many children can sit through such a long film? This point extends further into the film's classification of a 12A, with some very dark moments and creatures that may not appropriate for the younger potential audience members. In this sense the film seems confused between deciding what it wants to be: the separate and more family orientated tale of The Hobbit, or the dark and foreboding precursor to The Lord of the Rings. However as I touched upon earlier, it was the prequel nature of the film that made it so enjoyable for me. As you'd expect the film ends on the cliff-hanger of the further journey ahead, and with certain elements of the LOTR trilogy already in place, I left the cinema in anticipatory excitement not only for the next chapter of The Hobbit story, but also to see how this will further lead into the events of The Lord of the Rings. The film ends on an exciting high note that will make the year long wait for The Desolation of Smaug a painful one. 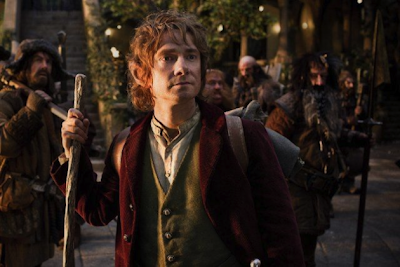 Bilbo and the Dwarves face their greatest challenge yet - the long wait for the sequel! 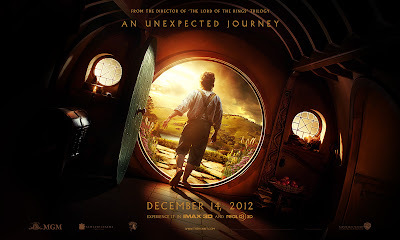 The Hobbit: An Unexpected Journey (certificate 12A) is now showing in cinemas across the UK. Have you seen the first instalment of The Hobbit Trilogy? Agree or disagree with my review? Leave your thoughts and opinions in the comments section below!